Until the Star Frontiers sub-forum gets recreated, I'll post these here. 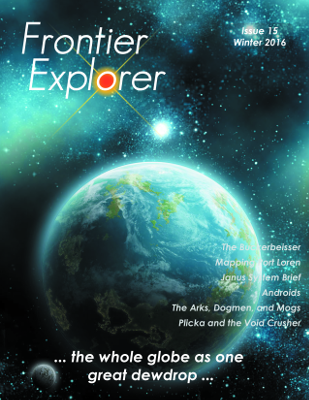 Issue 15 of the Frontier Explorer is now available from either DriveThruRPG or the Frontier Explorer website. A special shout out to author Laura Mumma who provided several features for this issue with her revisiting of Janus, a planet presented as part of a Star Frontiers competition module at MassConfusion in 1984. She’s cleaned up the planet and critters and presented them anew for use in your game. In addition we have many of our regular features such as a new Jurak Hangna article, more equipment from the Minzii Marketplace and the regular comics. Also included are an article about recreating the original Port Loren map, an Alex Stone article, some new races, and more. Grab your copy today and remember to always keep exploring. 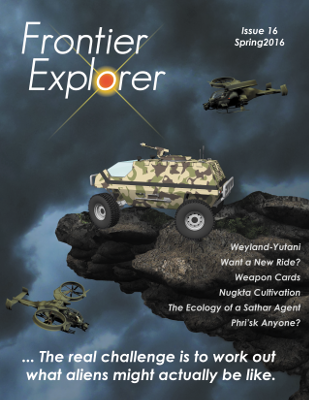 Issue 16 of the Frontier Explorer is now available at the magazine's website or DriveThruRPG . This issue is a big reminder that this really is a community magazine and that we couldn’t do it without you. A special thanks to Joseph Cabadas and Chris Donovan who stepped up and provided a huge number of articles for this issue. In this issue you’ll find a variety of new equipment, weapons, and vehicles, as well as a complete system brief for the S’sessu home worlds, equipment, flora, and fauna related to the S’sessu, and hooks to help bring the S’sessu into your campaign. In addition, we have some great weapon stat cards that you can print out and use at your table to keep track of the various weapons in the party and owned by the NPCs. I hope you enjoy this issue as much as I did. So grab your copy and remember to always keep exploring.